(Boston, MA) – BOND, the Northeast’s premier full-service construction management and general contracting company, recently celebrated the dedication of Stonehill College’s Rev. Mark T. Cregan C.S.C. Athletic and Fitness Center at the Sally Blair Ames Sports Complex in Easton, Massachusetts. 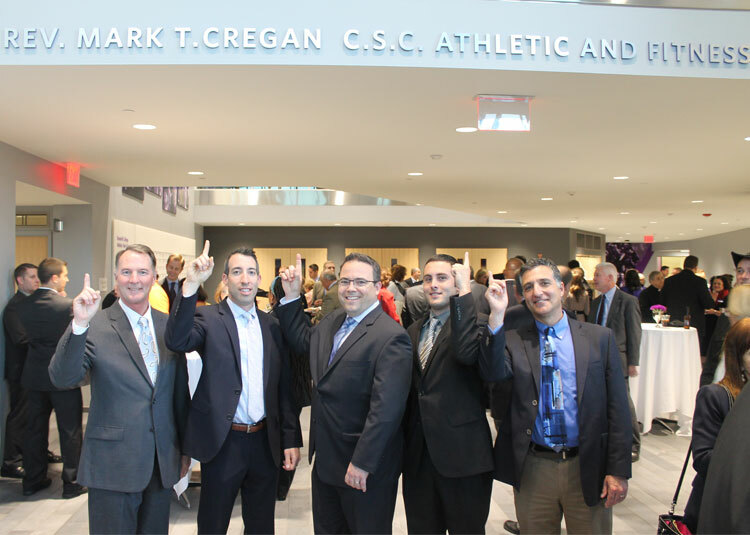 The ceremony honored the facility’s namesake, who served as Stonehill’s President for 13 years. Built by BOND and designed by Sasaki Associates, the Center accommodates Stonehill’s need for more athletic space due to a steady increase in student enrollment. The new Center is a result of a major 24,000 square foot renovation and a 50,000 square foot expansion of the College’s Sally Blair Ames Complex, originally built in 1988. Now serving more than 2,500 students, the comprehensive facility provides room for recreational group exercise and dance, as well as weight and fitness facilities and locker rooms. Training and office space for Stonehill’s field hockey, lacrosse, soccer, baseball and football teams occupies the addition’s first floor. The facility also houses the Lou Gorman Pavilion, named in honor of the Stonehill alumnus and former Red Sox General Manager. The Pavilion contains exhibition space showcasing sports memorabilia donated by Gorman to his alma mater. BOND successfully delivered this state-of-the-art athletic facility in August 2015 on a busy academic campus in and around adjacent, occupied living and learning space. The utilization of the firm’s in-house laser scanning capabilities facilitated the renovation and expansion process through the development of accurate as-built documentation that led to a smooth coordination process. “BOND is proud to provide Stonehill with a revitalized center for campus athletics and recreation,” said Robert Murray, BOND President.